Protect Your Leg Veins – They have the Toughest job of Carrying Blood to your Heart! Commonly Called Spider Veins – What are They? 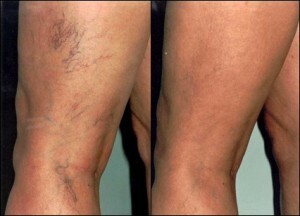 Spider veins can occur on any area of the body, but are most common on the legs and face. While spider veins can occur in both men and women, they are more prevalent in females and it seems that the hormones estrogen and progesterone play a role in their development. Changes in body chemistry due to puberty, birth control pills, menopause, and hormone therapy can bring them on. Constrictive clothing, such as tight hosiery and girdles can also cause spider vein development. Spider veins on the face can result from too much sun exposure. What Is Laser Vein Treatment? Laser therapy can be very effective in treating unsightly broken and dilated vessels as well as other unwanted vascular lesions, such as spider veins, rosacea. In fact, the latest advances in laser technology have made it safer, faster and more effective than any previous treatment for these conditions. What’s Nd Yag? ND Yag is used to remove capillaries and veins on the legs and face. The laser is attracted to the blood flow in the vessel, collapsing the unnecessary vessels. The Nd Yag long pulse laser can be used safely on all skin types. Fast repetition rates and large coverage areas allow large areas of the body to be treated quickly.